As a lad I recall thinking of Californian beaches as odd places, especially since I held the NJ beach towns of Ocean City and Wildwood as a standard. I remember pondering the concept of having multiple parking lots near a beach as crazy and that it sounded mildly unpleasant to lift weights on a beach (the sand would surely chafe). But now that I'm older, the uniqueness of the CA coast (both natural and cultural differences) holds great allure, especially in a town like Santa Monica. Granted I've only visited once, but the meld of boutique-lined streets and serene beaches is a beautiful and rare combination in the US. One venue that caught my attention was Caffe Luxxe, a coffeehouse that aims to provide a European cafe experience, including quality coffee. The establishment sits in a row of shops with a black awning and a wooden bench. Within the doors, the cafe is set up in a monochromatic yet very swanky manner. They roast their own coffee, providing only one offering. The drip provided a smooth coffee with a touch of raisins and a noticeable peppery zest. The espresso, pulled short and with what seemed to be trepidation (I think the barista was having a rough day), delivered a sweet tang with a velvety finish and a nice acidity, with only a subtle bit of char on the end. The tea is free leaf. 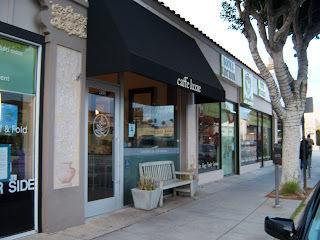 While my success with coffeehouses in other ocean-front cities exists, I would say Caffe Luxxe stood out as yet another unique facet of California beaches (or the towns that own them at the very least). If you happen to be in town, swagger your way over to Caffe Luxxe. I too liked Caffe Luxxe and was surprised to find no coffee geeks. Their baristas prove tattoos are not a prequisite towards making a good espresso.